What have I been thinking?! I ought to have posted these photos months ago!! They kind of got lost in my very fallible photo catalogue system. I must get a grip. 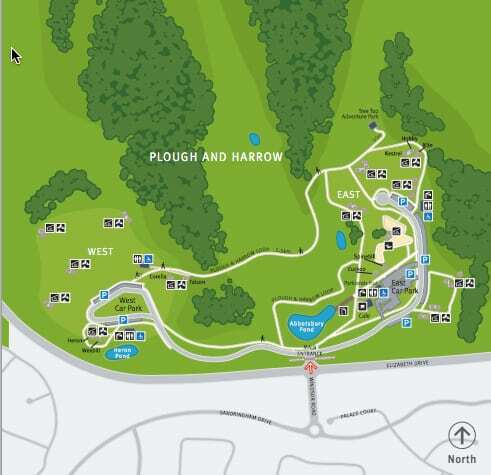 Because Plough and Harrow Park has a really good playground, well worth a visit. 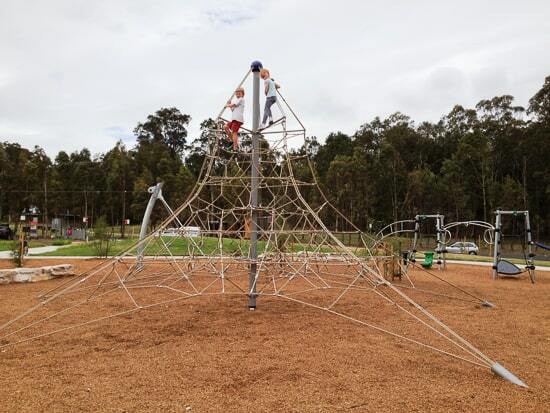 The playground and picnic area is very close to Tree Top Adventure Park and makes a great add-on to a visit there. Don’t be fooled by these photos. We were there on a cloudy day when it was very quiet, but this really is a popular spot. No wonder. 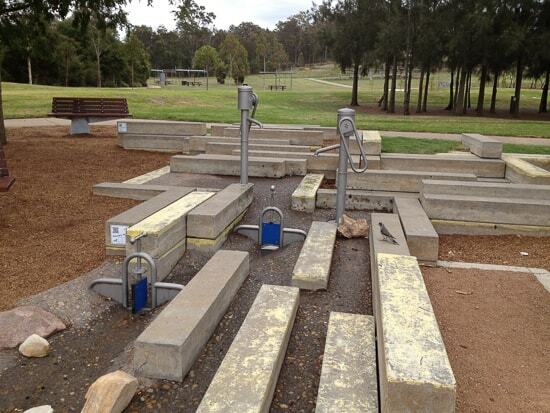 Keep up to date with events/closures etc at Western Sydney Parklands Facebook page. 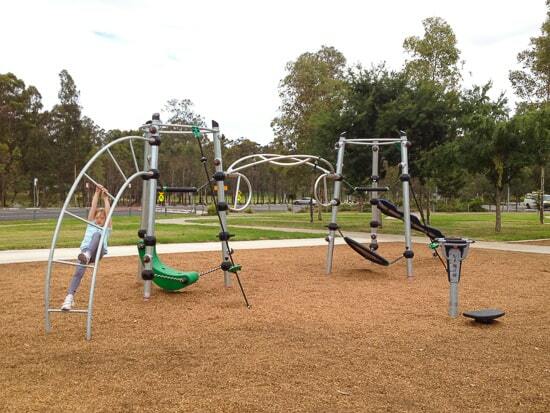 This is a really large playground with equipment to suit children of all ages. 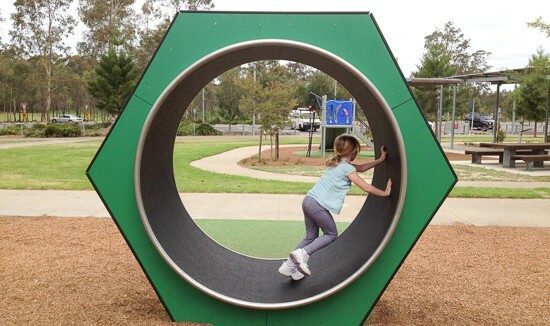 My twins adored the rotor and spent ages and ages whirling around in that. 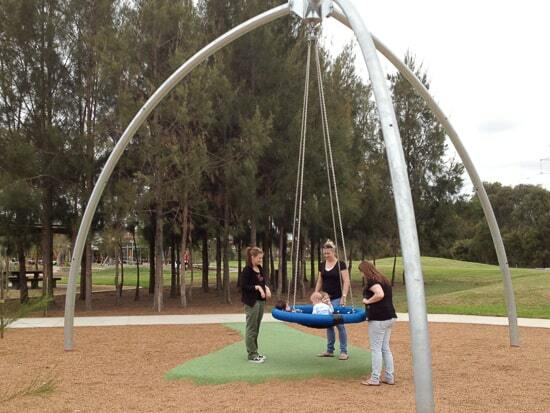 They liked the water play area too and the big circular swings structure. 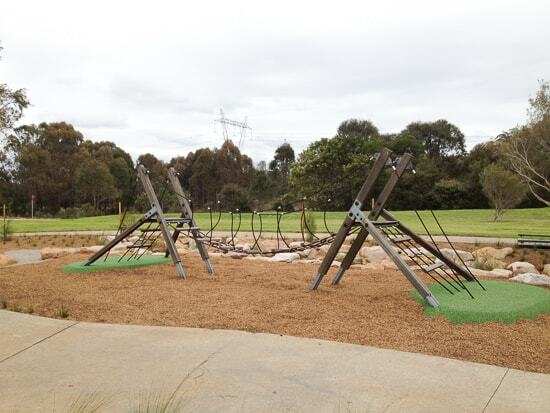 By the sandpit is some toddler play equipment, with little cubby and slide. 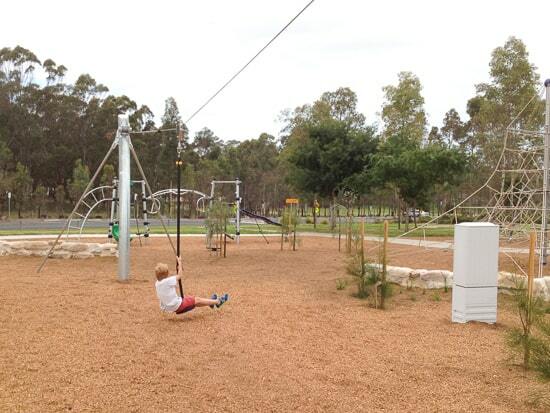 The rope bridges, larger climbing frames, spinning ring, flying fox and swings are delightful for the older kids. There are large picnic shelters (some can be booked ahead by groups) and free gas BBQs, plenty of grassy areas for ball games and a bike track for children too. Plough and Harrow West Picnic Area is very close, this is a large space with BBQs and picnic shelters. Shade: Some but lots of the play equipment in in full sun. Extra: Tree Top Adventure Park is very close by, you can use the same car park and just walk up the grassy slope to get to it. The Western Sydney Parklands track and M7 cycleway are nearby too. 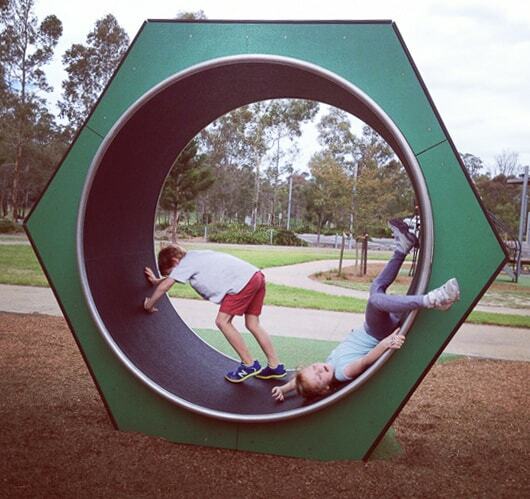 Straight up the climbing frame, my twinnies are like rats up a drain pipe. 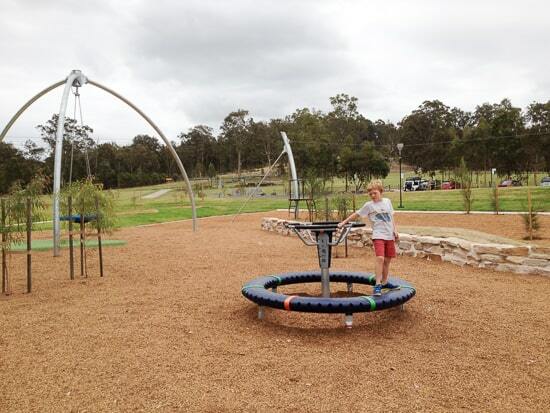 Have you visited Plough and Harrow Park Playground? 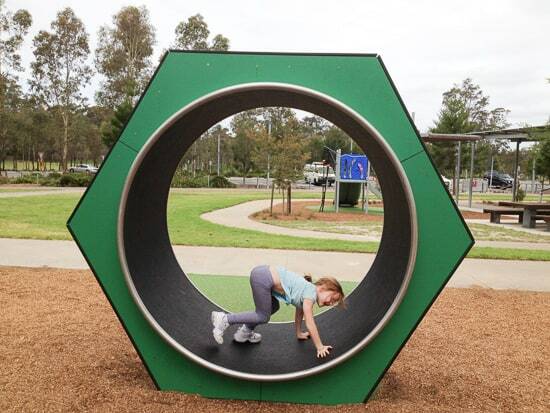 Or the lovely Lizard Log Playground, also in Western Sydney Parklands? Shall we meet soon for a picnic and a play? So much equipment and all that wonderful open space too! Just perfect. 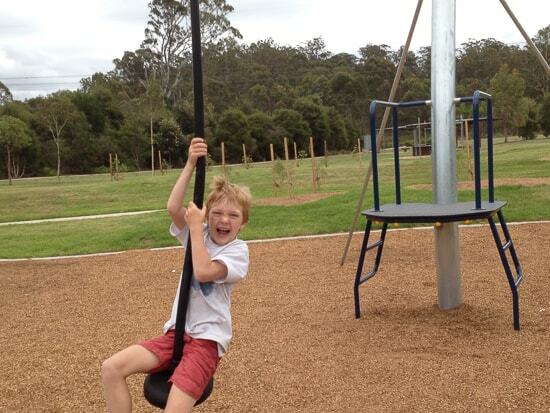 Yes spot on, Sydney’s playgrounds have been wearing my kids out and thus saving my sanity for 15 years. And it’s not over yet! Hope you are enjoying the weekend. i was wondering if dogs are allowed ? Hello, I am sure that dogs are not allowed in the section of the park where the playground is. 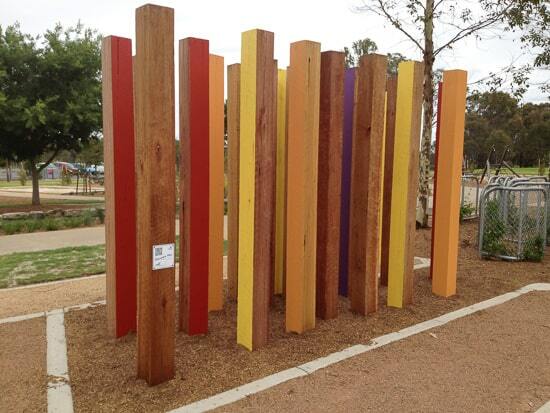 Perhaps you could have a google around, searching ‘Western Sydney Parklands’ and ‘off leash area dogs” might find you some good places to let the dog have a play.